The Encore Products Team is excited to announce the release of new ‘Project Price’ functionality for customers using their Subscription Billing solution for Dynamics GP. The Project Price feature has been added as part of a cost share development initiative along with one of our long time GP clients. We added the functionality that they required for their business, but took the project one step further and released this great new functionality to all our clients. This was a win/win project. A win for the client, as Encore will upgrade and maintain the new functionality going forward, and a win for all Encore Subscription Billing clients current and future, as they now have access to new functionality when they upgrade or install the latest build for their current version of GP2018, GP2016 or GP2015. 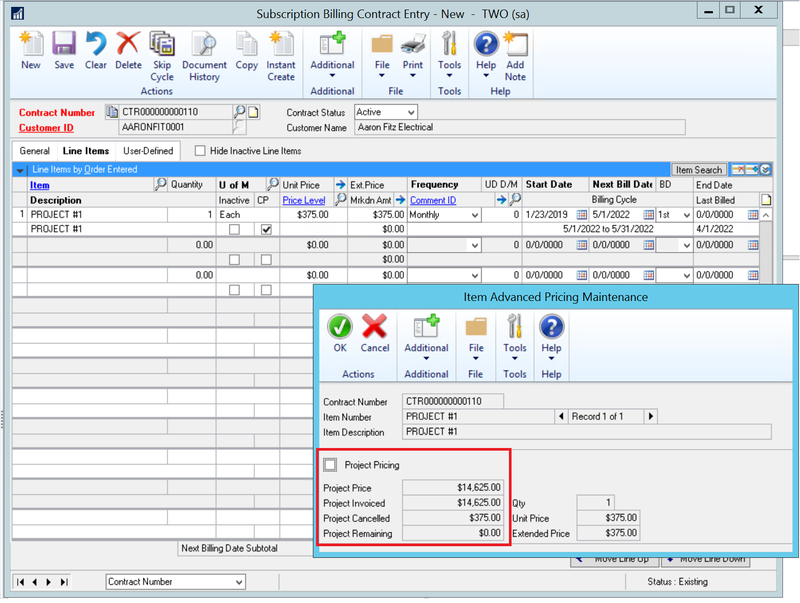 Project Pricing provides the ability to assign a total amount to bill your client for the Contract Line Item and let Subscription Billing keep track of what has been billed to date, the amount remaining to be billed, and once all Sales Transactions have been generated, inactivate the Contract Line Item. 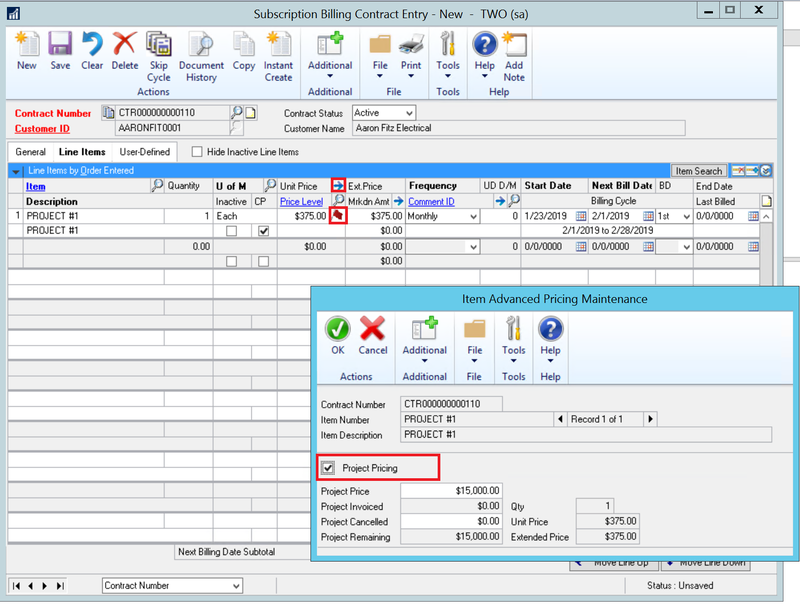 To activate Project Pricing for a line item, add the line item to the customer’s Subscription Billing Contract, accept the Unit Price or set a Contract Price for the line item (this is the Unit Price to be used each time the line is added to a Sales Transaction); assign the Frequency, Start Date, Next Bill Date etc. and drill into the Item Advanced Pricing Maintenance window by selecting the blue zoom into arrow in the Unit Price field label. This will open the ‘Item Advanced Pricing Maintenance’ window. Select the checkbox to turn on Project Pricing for the line item and enter the total Project Price. Select ‘OK’ to save the information and close the window. Line items that have Project Pricing enabled will be obvious when viewing the line item in Contract Entry, as a visual indicator (a little red flag) is added next to the Unit Price. The Contract Line Item will be pulled when creating Sales Transactions out of Subscription Billing based on the Frequency and Next Bill Date, up until the Project Remaining is $0.00. At this point the line item will be considered ‘billing complete’ and will be updated to an Inactive status so that it is no longer considered for future billing runs. It’s possible to turn off Project Pricing for a line after it has been activated and billed. When deselecting the Project Pricing checkbox, you will be notified that you are turning off the feature. Should you proceed, the Project Cancelled Amount will be updated with the amount that is remaining for the line item; the visual indicator (flag) will be removed from the Unit Price field and the line will continue to bill based on the Unit Price, Frequency and Next Bill Date until the End Date is met (if defined). **Please be aware that you will not be able to enable Project Pricing for a line item if it has been previously invoiced. A new line item will need to be added to the Subscription Billing Contract in those instances. Encore has also added support for the new Project Pricing feature to Subscription Billing Importer, so it is also possible to define Project Pricing for your Subscription Billing Contract line items via the Importer. If you have any questions relating to this new feature or any of the other add-on solutions that Encore has developed for clients using Microsoft Dynamics GP, please contact us. Sherry (Sam) Bettencourt has been working with Microsoft Dynamics GP since 1997. As Encore’s Practice Lead for Encore Applications, Sherry is the point person for all of Encore’s products. She enjoys the camaraderie of the partner network and is an active member in the Dynamics community.